President Kennedy’s tax rate reductions were a big success. Sadly, very few modern Democrats share JFK’s zeal for pro-growth tax policy. Bernie Sanders wants a huge increase in the death tax. Elizabeth Warren wants a punitive wealth tax. Alexandria Ocasio-Cortez and others want confiscatory tax rates. And there’s another arrow in the class-warfare quiver. The Wall Street Journal reports on a misguided new idea from Ron Wyden, the ranking Democrat on the Senate Finance Committee. The top Democrat on the Senate’s tax-writing committee proposed taxing unrealized gains in investment assets every year at the same rates as other income…an idea that would transform how the U.S. taxes the wealthiest people. …Under Mr. Wyden’s concept, capital gains would be taxed annually based on how much assets have gained in value. Now, by contrast, gains are taxed only when assets are sold and at a top rate of 23.8% instead of 37% for ordinary income. There are two big reasons why this is a terrible idea. First, the right policy is to abolish any tax on capital gains. Drop the rate to zero. Simply stated, there shouldn’t be an added layer of tax on people who earn money, pay tax on that money, and then buy assets with some of the remaining after-tax income. Especially since the income generated by that additional investment already would be hit by the corporate income tax and the extra layer of tax on dividends. This system is also very bad for workers because of the long-standing relationship between investment and employee compensation. Second, levying such a tax would be a logistical nightmare. Here’s another brief excerpt from the article. Mr. Wyden’s concept would present logistical challenges. He would need to figure out how to value complex assets, handle declines in value, deal with people without enough cash to pay the tax and address illiquid investments such as closely held businesses and real estate. So why would Sen. Wyden propose such a clunky class-warfare scheme? Because it would generate (at least on paper) a lot of money that could be used to buy votes. This mark-to-market tax concept…could raise substantial money. A similar proposal…would generate an estimated $125 billion in 2025 alone… Democrats, who are campaigning on wide-ranging and costly ideas for more spending on health care, infrastructure and education, can point to plans by Mr. Wyden and others to explain how they would pay for policy proposals. Of course, no amount of tax increases would generate the revenue to finance the so-called Green New Deal. In reality, a major reason for Wyden’s plan is that the left is motivated by class warfare rather than revenue collection. Democrats have frequently found unfairness in the different ways that the U.S. tax system approaches wage and investment income. They have focused their response, in part, on the “Buffett Rule”, inspired by Warren Buffett’s claim that he pays a lower tax rate than his secretary. I added this final excerpt simply so I can point out that Buffett’s claim is utter nonsense. And so is the “Buffett rule” that some folks on the left have proposed. I’ll close by noting that the United States has one of the world’s least friendly tax codes for investment. The lower corporate rate in the Trump tax plan was a step in the right direction. But even with that positive reform, the overall tax burden on capital gains is very high compared to America’s major trading partners. And now Senator Wyden wants to make a bad situation worse. For further information, here’s my video explaining why there shouldn’t be any tax on capital gains. P.S. Uncle Sam also forces investors to pay capital gains tax when assets rise in value because of inflation. I wrote last month about a new book from the Fraser Institute about demographics and entrepreneurship. My contribution was a chapter about the impact of taxation, especially the capital gains tax. At a panel in Washington, I had a chance to discuss my findings. If you don’t want to watch an 11-minute video, my presentation can be boiled down to four main points. So I shared this chart with the audience and emphasized that a modest-sized welfare state may have been feasible in the past, but will be far more burdensome in the future for the simple reason that the ratio of taxpayers to tax-consumers is dramatically changing. 2. Entrepreneurship drives growth – Capital and labor are the two factors of production, but entrepreneurs are akin to the chefs who figure out news ways of mixing those ingredients. 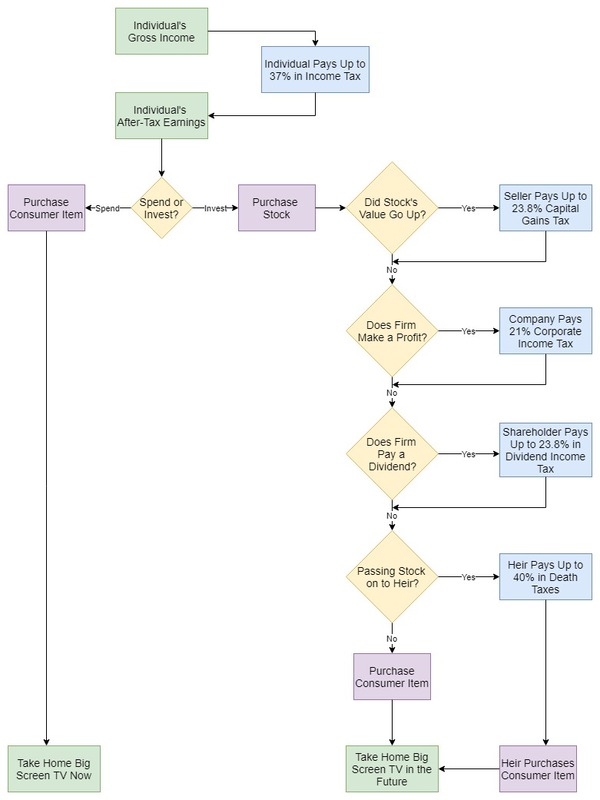 I shared my flowchart showing how the American tax code is biased against income that is saved and invest, which discourages entrepreneurial activity. 4. The United States need to be more competitive – Last but not least, I pointed out that America’s class-warfare tax policies are the fiscal equivalent of an “own goal” (soccer reference for World Cup fans). But the bottom line is still uncompetitive when looking at the tax burden on investment. P.S. The Wall Street Journal produced an excellent description of why capital gains taxation is very destructive. I’ve written over and over again that changing demographics are a very under-appreciated economic development. I’ve also written about why entrepreneurship is a critical determinant of growth. But I never thought of combining those topics. 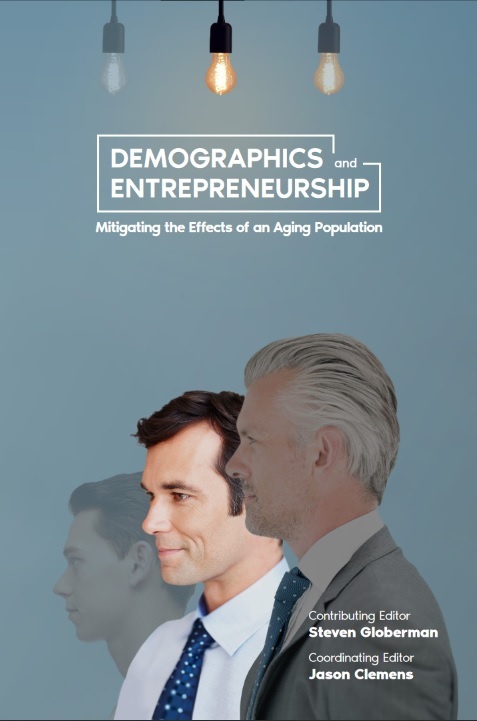 Fortunately, the folks at the Fraser Institute had the foresight to do just that, having just published a book entitled Demographics and Entrepreneurship: Mitigating the Effects of an Aging Population. There are chapters on theory and evidence. There are chapters on specific issues, such as taxes, regulation, migration, financial markets, and education. It’s basically the literary equivalent of one-stop-shopping. You’ll learn why you should be concerned about demographic change. 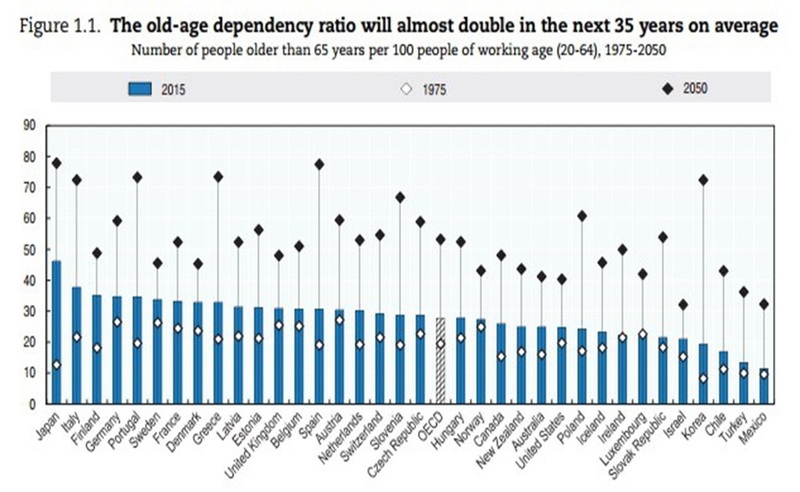 More important, since there’s not much policy makers can do to impact birthrates, you’ll learn everything you need to know about the potential policy changes that could help nations adapt to aging populations. This short video is an introduction to the topic. Let’s look at just a few of the highlights of the book. In the opening chapter, Robert Murphy offers a primer on the importance of entrepreneurship. …there is a crucial connection between entrepreneurship and economic prosperity. …There is a growing recognition that a society’s economic prosperity depends…specifically on entrepreneurship. …Two of the top names associated with the theory of entrepreneurship are Joseph Schumpeter and Israel Kirzner… Schumpeter famously invoked the term “creative destruction” to describe the volatile development occurring in a capitalist system… Kirzner has written extensively on entrepreneurship…and how…the alert entrepreneurial class who perceive these misallocations before their more complacent peers, and in the process earn pure profits… Schumpeter’s entrepreneur is a disruptor who creates new products first in his mind and then makes them a reality, whereas Kirzner’s entrepreneur is a coordinator who simply observes the profit opportunities waiting to be grasped. …If the goal is maximum economic efficiency in the long run, to provide the highest possible standard of living to citizens within the unavoidable constraints imposed by nature, then we need bold, innovative entrepreneurs who disrupt existing modes of production by introducing entirely new goods and services, but we also need vigilant, alert entrepreneurs who spot arbitrage opportunities in the existing price structure and quickly move to whittle them away. Murphy describes in the chapter how there was a period of time when the economics profession didn’t properly appreciate the vital role of entrepreneurs. But that fortunately has changed and academics are now paying closer attention. He cites some of the recent research. An extensive literature documents the connection between entrepreneurship and economic growth. The studies vary in terms of the specific measure of entrepreneurship (e.g., small firms, self-employment rate, young firms, etc.) and the size of the economic unit being studied. …Carree et al. (2002) look at 23 OECD countries from 1976 to 1996. …They “find confirmation for the hypothesized economic growth penalty on deviations from the equilibrium rate of business ownership… An important policy implication of our exercises is that low barriers to entry and exit of businesses are necessary conditions for the equilibrium seeking mechanisms that are vital for a sound economic development” …Holtz-Eakin and Kao (2003) look at the birth and death rates of firms across US states, and find that this proxy for entrepreneurship contributes to growth. Similarly, Callejón and Segarra (1999) look at manufacturing firm birth and death rates in Spain from 1980 to 1992, and conclude that this measure of “turbulence” contributes to total factor productivity growth. …Wennekers and Thurik (1999) use business ownership rates as a proxy for “entrepreneurship.” Looking at a sample of 23 OECD countries from 1984 to 1994, they, too, find that entrepreneurship was associated with higher rates of employment growth at the national level. In a chapter on taxation, Seth Giertz highlights the negative impact of taxes on entrepreneurship, particularly what happens with tax regimes have a bias against saving and investment. High tax rates discourage both consumption and savings. But, for a given average tax rate, taxes on an income base penalize savings more heavily than taxes on consumption. …a consumption tax base is neutral between the decision to save versus consume. By contrast, an income tax base results in the double taxation of savings. …three major features of tax policy that are important for entrepreneurship. First, capital accumulation and access to capital is essential for innovation to have a big impact. Despite this, tax systems generally tax savings more heavily than consumption….Second, the tax treatment of risk affects incentives for entrepreneurship, since entrepreneurship tends to entail high risk. …progressivity can sometimes discourage entrepreneurship. This is because tax systems do not afford full offsets for losses, making progressivity effectively a tax increase. …Third, tax policy can lead entrepreneurial activity to shift from productive toward unproductive or destructive aims. Productive entrepreneurship tends to flourish when the route to great wealth is achieved primarily through private markets… High taxes reduce the rewards from productive entrepreneurship. All too often, smart, talented, and innovative people are drawn out of socially productive endeavours and into unproductive ones because the private returns from devising an innovative tax scheme—or lobbying government for special tax preferences—are greater than those for building the proverbial better mousetrap. In a chapter I co-authored with Brian Garst, Charles Lammam, and Taylor Jackson, we look specifically at the negative impact of capital gains taxation on entrepreneurship. We spend a bit of time reminding readers of what drives growth. One of the more uncontroversial propositions in economics is that output is a function of labor (the workforce) and capital (machines, technology, land, etc.). Indeed, it is almost a tautology to say that growth exists when people provide more labor or more capital to the economy, or when—thanks to vital role of entrepreneurs—labor and capital are allocated more productively. In other words, labor and capital are the two “factors of production,” and the key for policymakers is to figure out the policy recipe that will increase the quantity and quality of those two resources. …In the absence of taxation, people provide labor to the economy so long as they value the income they earn more than they value the foregone leisure. And they provide capital to the economy (i.e., they save and invest) so long as they value future consumption (presumably augmented by earnings on capital) more than they value current consumption. And we highlight how entrepreneurs generate the best type of growth. this discussion also helps illustrate why entrepreneurship is so important. The preceding analysis basically focused on achieving growth by increasing the quantity of capital and labor. Such growth is real, but it has significant “opportunity costs” in that people must forego leisure and/or current consumption in order to have more disposable income. Entrepreneurs, by contrast, figure out how to increase the quality of capital and labor. More specifically, entrepreneurs earn profits by satisfying consumer desires with new and previously unknown or underused combinations of labor and capital. In their pursuit of profit, they come up with ways of generating more or better output from the same amount of labor and capital. This explains why we have much higher living standards today even though we work far fewer hours than our ancestors. And here’s what we say about the counterproductive impact of capital gains taxation, particularly when combined with other forms of double taxation. …the effective marginal tax rate on saving and investment is considerably higher than the effective marginal tax rate on consumption. This double taxation is understandably controversial since all economic theories—even Marxism and socialism—agree that capital is critical for long-run growth and higher living standards. 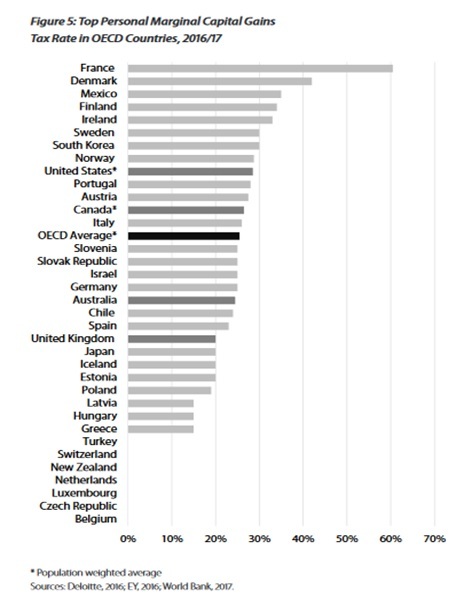 …capital gains taxes harm economies in ways unique to the levy. …entrepreneurs play a vital role in the economy since they figure out more efficient ways to allocate labor and capital. …The potential for a capital gain is a big reason for the risk they incur and the effort they expend. Thus, the existence of capital gains taxes discourages some entrepreneurial activity from ever happening. …the capital gains tax is more easily avoidable than other forms of taxation. Entrepreneurs who generate wealth with good ideas can avoid the levy by simply choosing not to sell. This “lock-in effect” is not good for the overall economy… Most governments do not allow taxpayers to adjust the value of property for inflation when calculating capital gains. Even in a low-inflation environment, this can produce perverse results. …taxpayers can sometimes pay tax even when assets have lost value in real terms. …Capital gains taxes contribute to the problem of “debt bias,” which occurs when there is a tax advantage for corporate investments to be financed by debt instead of equity. …Excessive debt increases the probability of bankruptcy for the firm and contributes to systemic risk. We then cite a lot of academic studies. I strongly encourage folks to peruse that section, but to keep this column manageable, let’s close by looking at two charts that reveal how some nation – including the United States – have uncompetitive tax systems. 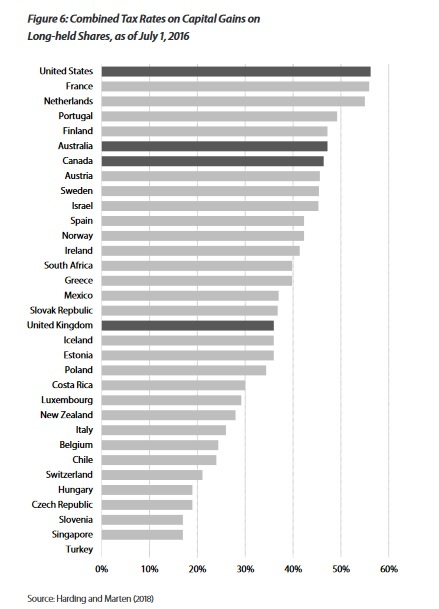 Here are long-run capital gains tax rates in developed nations. 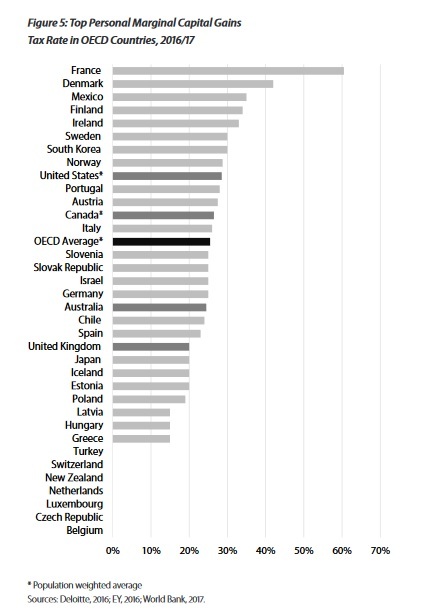 By the way, even though the data comes from a 2018 OECD report, it shows tax rates as of July 1, 2016. So not all the numbers will be current. For instance, I assume Macron’s reforms have mitigated France’s horrible score. Speaking of horrible scores, here are the numbers showing the combined burden of the corporate income tax and capital gains tax. Sadly, the United States was at the top of this list as of July 1, 2016. The good news is that the recent tax reform means that the United States no longer has the world’s most punitive tax system for new investment. Though keep in mind that the United States doesn’t allow investors to index capital gains for inflation, so the effective tax rate on capital gains will always be higher than the statutory tax rate. Ideally, there should be no capital gains tax. After all, the levy is a self-destructive form of double taxation that reduces the quantity and quality of investment. And that’s not good for wages and jobs. To add insult to injury (to be more accurate, to add injury to injury), the tax isn’t indexed for inflation. So investors get taxed on the full increase in the value of an asset even though a significant chunk of the increase often is due solely to inflation. Steven Entin of the Tax Foundation has some new research on this issue. Many elements of the income tax are adjusted for inflation, such as tax brackets, standard deductions, and income thresholds or dollar amounts of some tax credits. However, the purchase price of assets later sold for capital gains or losses is not adjusted for inflation. As a result, inflation can do a real number on savers by turning real losses into taxable nominal gains. To avoid such outcomes, it would make sense for the government to allow an inflation adjustment for the cost of assets. Steve points out that the absence of indexing is very brutal during periods of high inflation – which may soon become a relevant issue again. During the late 1960s and 1970s, when inflation was high and the stock market was flat, it was not uncommon for people who sold assets to report inflated nominal capital gains that were negative in terms of purchasing power. In effect, the savers were taxed on a real loss. …Suppose one had bought $100 of stock in the XYZ Corporation in 1965, and sold it in 1981, for $110. This looks like a $10 gain. But…The stock would have had to rise to $286 just to keep pace with inflation. …the investor lost $176, in 1981 dollars ($286 – $110). Any tax collected on the nominal $10 gain was, in fact, a tax on a real loss. But even if inflation remains low, this is still an important issue. Taxing genuine capital gains is bad enough, so it’s not a surprise to learn that taxing inflationary gains is even worse. It exacerbates the anti-capital bias in the current tax code. Taxation of fictitious gains or other capital income reduces saving and raises the cost of capital, thereby retarding investment, productivity growth, and wage growth. …In an ideal tax system, saving would not be treated worse than consumption. …When we earn income and pay tax, and use the after-tax income for consumption, the federal government generally leaves the consumption alone, except for a few excise taxes… The earnings are taxed, but not the enjoyment of the subsequent purchases. Saving is a purchase too. It lets us “buy” a stream of future income with after-tax money. But if we buy a bond, the stream of interest is taxed. If we buy a share of stock, the dividends are taxed, and any reinvested earnings that increase the value of the company are taxed as capital gains. Inflation raises the price of many assets acquired by savers. When they sell the assets, much of their capital gains may be due only to inflation. Inflation-related gains are not a real increase in wealth. Indexing the purchase price (tax basis) for inflation would provide savers some relief for this type of tax on fictitious income. Well said, though I have one minor quibble. A capital gain, whether real or caused by inflation, is not income. It’s a change in nominal net worth. Though I’m sure Steve would agree with me. He’s presumably using “income” because the tax code treats that change in net worth as income. There is a chance we’ll see some progress on this issue. Ryan Ellis, writing for Forbes, is optimistic that the newly appointed head of Trump’s National Economic Council will try to fix this problem. There’s one project that Kudlow needs to get to work on right away: indexing the basis of capital gains to inflation. …Just last August, Kudlow wrote an op-ed…urging President Trump to do this by executive order. …This finally may be the time that this issue is ready to cross the finish line. Yes, because the law specifies the rates for capital gains taxation, but it’s up to the Treasury Department to specify what counts as a gain. And there’s a very strong argument that it’s not a genuine gain if an asset rises in value solely because of inflation. Ryan explains the mechanics of how indexing would work..
How would indexing capital gains basis to inflation work? In the tax world, reporting a capital gain is a pretty simple exercise. When you sell an asset, like a stock, you report how much you sold it for. You can subtract what you bought it for (your “basis”) from what you sold it for to arrive at your gain. …If you’ve held the asset longer than a year, you generally pay tax at…20 percent, plus the 3.8 percent Obamacare investment surtax… A problem arises in that your basis purchase may have happened many years ago. The real value of the money you used to buy a stock has been eroded by inflation. For example, $100 in 1990 is only worth $51.41 today, a little more than half the supposed basis in real terms. 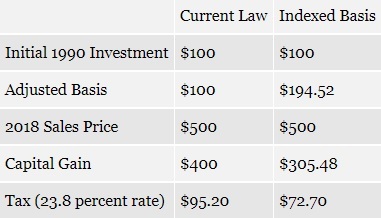 …Someone whose $100 initial investment has grown to $500 would see a big difference in taxes. Here’s the table showing that difference. And here’s what it means. Uncle Sam still gets to tax the gain–he just doesn’t get to take the phantom gains attributable to inflation. In fact, $22.50 of the current law tax–nearly one quarter of the tax bill–is entirely due to inflation, not any real increase in wealth. …This law change would help owners of real estate, including corporate owners of real estate. It would help small businesses who pay the capital gains tax when acquired by larger firms. It would help everyone in America with a prized collection of old baseball cards or stamps sitting in an album in their den. This is truly a tax cut for everyone. For more information, here’s a video on the topic from the Center for Freedom and Prosperity. As was pointed out in the video, Ronald Reagan indexed much of the tax code as part of his 1981 tax cut. Now it’s time to take the next step. But let’s not forget that indexing should only be an interim step (assuming, of course, that the White House and Treasury are willing to do the right thing and protect investors from inflation). The real goal should be total repeal of the capital gains tax. Why would the economy grow faster if we got fundamental reform such as the flat tax? In part, because there would be one low tax rate instead of the discriminatory and punitive “progressive” system that exists today. As such, the penalty on productive behavior would be reduced. In part, because there would be no distorting tax breaks that lure people into making decisions based on tax considerations rather than economic merit. But we’d also enjoy more growth because there would be no more double taxation. 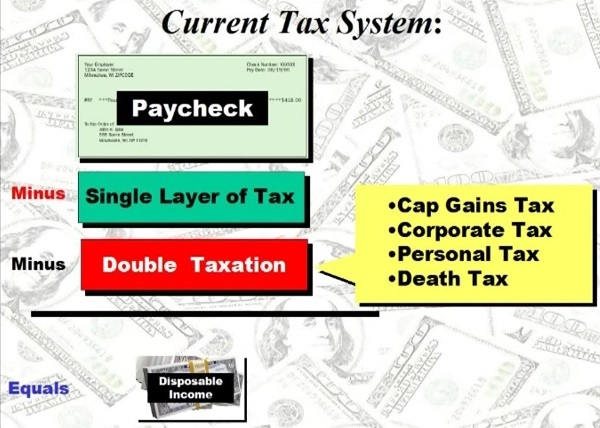 Under a flat tax, the death tax is abolished, the capital gains tax is abolished, there’s no double taxation on savings, the second layer of tax on dividends is eliminated, and depreciation is replaced by expensing. In the wonky jargon of public finance economists, this means we would have a “consumption-based” system, which is just another way of saying that income would be taxed only one time. No longer would the internal revenue code discourage capital formation by imposing a higher effective tax rate on income that is saved and invested (compared to the tax rate on income that is consumed). Indeed, this is the feature of tax reform that probably generates the most growth. As I explain in this video on capital gains taxation, all economic theories – even Marxism and socialism – agree that capital formation is a key to long-run prosperity. The good news is that reducing double taxation is a goal of most major tax plans in Washington. Trump’s campaign plan reduced double taxation, and the House Better Way Plan reduces double taxation. But that doesn’t mean there’s an easy path for reform. The Hill reports on some of the conflicts that may sabotage legislation this year. The fight over a border-adjustment tax isn’t the only challenge for Republicans in their push for tax reform. …Notably, some business groups have criticized the proposal to do away with the deduction for businesses’ net interest expenses. …the blueprint does not specifically discuss how the carried interest that fund managers receive would be taxed. Under current law, carried interest is taxed as capital gains, rather than at the higher rates for ordinary income. During the presidential race, Trump repeatedly said he wanted to eliminate the carried interest tax break, and Office of Management and Budget Director Mick Mulvaney told CNN on Sunday that Trump still plans to do this. Many Democrats also want carried interest to be taxed as ordinary income. The border-adjustment tax is probably the biggest threat to tax reform, but the debate over “carried interest” also could be a problem since Trump endorsed a higher tax burden on this type of capital gain during the campaign. Here are some excerpts from a recent news report. Donald Trump vowed to stick up for Main Street over Wall Street — that line helped get him elected. But the new president has already hit a roadblock, with fellow Republicans who control Congress balking at Trump’s pledge to close a loophole that allows hedge fund and private equity managers to pay lower taxes on investment management fees. …The White House declined to comment on the status of negotiations between Trump and congressional Republicans over the carried-interest provision. …U.S. Rep. Jim Himes, D-Conn., a House Financial Services Committee member and former Goldman Sachs executive, said there is chaos on the tax reform front. “That’s on the list of dozens of things where there is disagreement between the president and the Republican majority in Congress,” Himes said. Regarding the specific debate over carried interest, I’ve already explained why I prefer current law over Trump’s proposal. Today I want to focus on the “story behind the story.” One of my main concerns is that the fight over the tax treatment of carried interest is merely a proxy for a larger campaign to increase the tax burden on all capital gains. For instance, the ranking Democrat on the Senate Finance Committee openly uses the issue of carried interest as a wedge to advocate a huge increase in the overall tax rate on capital gains. Of course, when you talk about the carried interest loophole, you’re talking about capital gains. And when you talk about capital gains, you’re talking about the biggest tax shelter of all – the one hiding in plain sight. Today the capital gains tax rate is 23.8 percent. …treat[ing] income from wages and wealth the same way. In my view, that’s a formula that ought to be repeated. The statists at the Organization for Economic Cooperation and Development also advocate higher taxes on carried interest as part of a broader campaign for higher capital gains taxes. Taxing as ordinary income all remuneration, including fringe benefits, carried interest arrangements, and stock options… Examining ways to tax capital income at the personal level at slightly progressive rates, and align top capital and labour income tax rates. It would be an overstatement to say that everyone who wants higher taxes on carried interest wants higher taxes on all forms of capital gains. But it is accurate to assert that every advocate of higher taxes on capital gains wants higher taxes on carried interest. 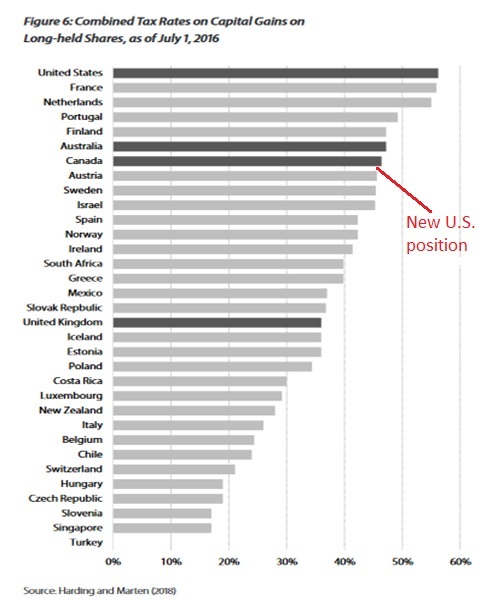 If they succeed, that would be a very bad result for American workers and for American competitiveness. For those wanting more information, here’s the Center for Freedom and Prosperity’s video on carried interest. Last but not least, wonky readers may be interested in learning that carried interest partnerships can be traced all the way back to medieval Venice. Start-up merchants needed investors, and investors needed some incentive to finance the merchants. For the investor, there was the risk of their investment literally sailing out of the harbor never to be seen again. The Venetian government solved this problem by creating one of the first examples of a joint stock company, the “colleganza.” The colleganza was a contract between the investor and the merchant willing to do the travel. The investor put up the money to buy the goods and hire the ship, and the merchant made the trip to sell the goods and then buy new foreign goods that could then be brought back and sold to Venetians. Profits were then split between the merchant and investor according to the agreements in the contract. Fortunately for the merchants and investors of that era, neither income taxes nor capital gains taxes existed. P.S. 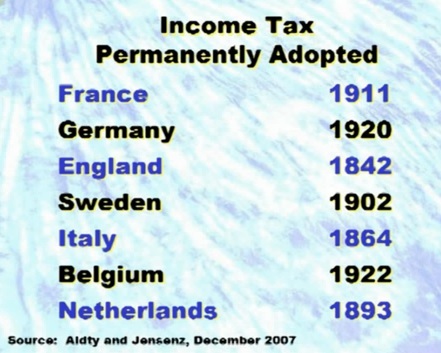 Italy didn’t have any sort of permanent income tax until 1864. Indeed, most modern nations didn’t impose these punitive levies until the late 1800s and early 1900s. The United States managed to hold out until that awful dreary day in 1913. It’s worth noting that the U.S. and other nations managed to become rich and prosperous prior to the adoption of those income taxes. And it’s also worth noting that the rapid growth of the 18th century occurred when the burden of government spending was very modest and there was almost no redistribution spending. P.P.S. Now that we have income taxes (and the bigger governments enabled by those levies), the only silver lining is that governments have compensated for bad fiscal policy with better policy in other areas. I’m a big fan of the flat tax because a low tax rate and no double taxation will result in faster growth and more upward mobility. I also like the flat tax because it gets rid of all deductions, credits, exemptions, preferences, exclusions, and other distortions. And a loophole-free tax code would be a great way of reducing Washington corruption and promoting simplicity. Moreover, keep in mind that eliminating all favors from the internal revenue code also would be good for growth because people then will make decisions on the basis of what makes economic sense rather than because of peculiar quirks of the tax system. Well, it’s not quite as simple as it sounds because there’s a debate about how to measure loopholes. Sensible people want a tax code that’s neutral, which means the government doesn’t tilt the playing field. And one of the main implications of this benchmark is that the tax code shouldn’t create a bias against income that is saved and invested. In the world of public finance, this means they favor a neutral “consumption-base” tax system, but that’s simply another way of saying they want income taxed only one time. Folks on the left, however, are advocates of a “Haig-Simons” tax system, which means they believe that there should be double taxation of all income that is saved and invested. You see this approach from the Joint Committee on Taxation. You see it from the Government Accountability Office. You see it from the Congressional Budget Office. Heck, you even sometimes see Republicans mistakenly use this benchmark. 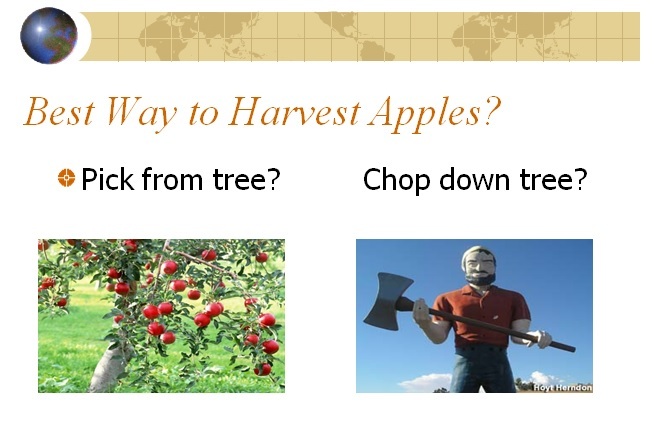 Let’s look at three examples to see what this means in practice. Example #1: Because they don’t want a bias that encourages people to spend their income today rather than in the future, advocates of a neutral tax code want to get rid of all double taxation of savings (Canada is moving in that direction). So that means they like IRAs and 401(k)s since those vehicles at least allow some savings to be protected from double taxation. Proponents of Haig-Simons taxation, by contrast, think that IRAs and 401(k)s are loopholes. Example #2: Another controversy revolves around the tax treatment of business investment. Advocates of neutral taxation believe in expensing, which is simply the common-sense view that investment expenditures should be recognized when they actually occur. Proponents of Haig-Simons, however, think that investment expenditures should be “depreciated,” which means companies are forced to pretend that most of their investment costs which are incurred today actually take place in future years. Example #3: Supporters of neutral taxation think capital gains taxes should be abolished because there already is tax on the income generated by assets such as stocks and bonds. So the “preferential rates” in the current system aren’t a loophole, but instead should be viewed as the partial mitigation of a penalty. Proponents of Haig-Simons, not surprisingly, have the opposite view. Not only do they want to double tax capital gains, they also want them fully taxed, which would mean an economically jarring jump in the tax rate of more than 15 percentage points. Now, having provided all this background information, let’s finally get to today’s topic. If you’ve been following the presidential campaign, you’ll be aware that there’s a controversy over something called “carried interest.” It’s a wonky tax issue that seems very complicated, so I’m very happy that the Center for Freedom and Prosperity has produced a video that cuts through all the jargon and explains in a very clear and concise fashion that it’s really just an effort by some people to increase the capital gains tax. There are four points from the video that deserve special emphasis. Partnerships are voluntary agreements between consenting adults, and both parties concur that carried interest helps create a good incentive structure for productive investment. Capital formation is very important for growth, which is one of the reasons why there shouldn’t be any capital gains tax. A capital gain doesn’t magically become labor income just because an investor decides to share a portion of the gain with a fund manager. An increase in the tax on carried interest would be the camel’s nose under the tent for more broad-based increases in the tax burden on capital gains. By the way, I liked that the video also took a gentle swipe at some of the ignorant politicians who want to boost the tax burden on carried interest. They claim they’re going after hedge funds, when the tax actually is much more targeted at private equity partnerships. But what really matters is not the ignorance of politicians. Instead, we should be focused on whether tax policy is being needlessly destructive because of high – and duplicative – taxes on saving and investment. Such levies would reduce investment. And that means lower levels of productivity and concomitantly lower wages. In other words, ordinary people will suffer a lot of collateral damage if this tax-the-rich scheme for carried interest is implemented.